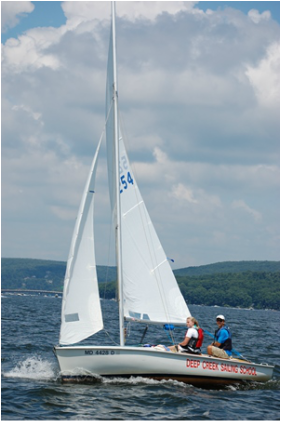 Adults age 16 and older can arrange for three-hour private sailing lessons throughout the summer using your own Flying Scot, or a Deep Creek Sailing School Flying Scot sailboat as available, for a fee of $250. Be sure to bring your own life jacket, dress for the weather and wear closed-toe tennis shoes or boat shoes with rubber soles. All sailors must wear life jackets at all times on or near the water. Lessons are taught by U.S. Sailing certified instructors and follow U.S Sailing prescribed safety protocol. Reservations for private lessons should must be made well in advance. We may not be able to accommodate last minute requests. Note: No flip-flops or similar type of shoes can be worn out sailing. DCSS students who are learning to race or advancing their racing skills may be invited to participate in Wednesday evening races; however, regular weekend racing requires membership in Deep Creek Yacht Racing Association (DCYRA). DCYRA has made some provisions for guest racers during holiday weekends, and students are encouraged to learn more about that by talking to their DCSS instructor.